Before we leave the topic of Digital Assets, I have one more excerpt from an article by Dennis Kennedy, who is an information technology lawyer and legal technology writer who publishes a monthly column in the ABA Journal. You can find the full text of the article at http://www.abanet.org/lpm/lpt/articles/ftr03103.shtml. The rapid explosion of digital information and accounts is making this a topic of interest to nearly everyone of us. I spent a large part of my early legal career as an estate planning lawyer. In the case of either death or incapacity, the first important step is to track down and identify all of the assets, liabilities and other concerns that must be addressed. Once an inventory is created, you can move forward with marshalling and collecting assets, identifying outstanding liabilities and paying them in a timely fashion, and dealing with outstanding issues, such as turning off utilities, canceling credit cards, arranging for storage or disposal and the like. In the real world, your family and designated successors (personal representative of your estate, trustee of your trust or attorney-in-fact under a durable power of attorney) will be aided immensely by any list of assets and liabilities that you can prepare for them and leave in a place that is easy for them to obtain. Hardware. Inventorying your hardware seems like an easier project that it actually will be. I suggest that you create a list of your hardware with a summary overview of what is on it. Creating the inventory is likely to be an eye-opener for you. 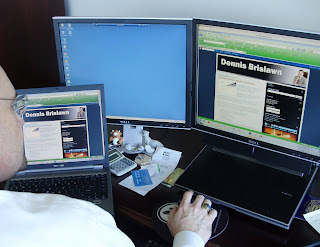 You are likely to find that you have important information not only on the computer system you use everyday, but also on multiple other computers. Many of us have at least one laptop and one or more desktop computers. Many people keep copies of vital information on their work computers. Where do you back up information? You might have many USB flash drives, USB hard drives, backup CDs or DVDs. There might be important pictures still on digital cameras and even information on iPods or other devices. Software. Do you use Quicken or another financial program? What income tax preparation programs do you use? Do you create spreadsheets or Word documents with important financial information? If you blog, is there a program that someone would need to use to post news to your blog? File structures. Your inventory should sketch out the main folders and places where you keep personal, financial and client files and documents. For someone like me, I also have audio and video of presentations and podcasts that I’d want someone to be able to locate and deal with. You might have important collections of family photos or videos or work in progress. Online presence. Create a list of your Web site(s), blog(s), Facebook and other social media accounts, online backup sites, online sites where you store documents, photos or other files, and listservs, groups or other sites to which you belong. Online accounts. Amazon and other shopping sites make it easy for you to create accounts and include credit card information. You might also have online access to bank and investment accounts. In fact, in many cases, you might no longer be receiving paper statements for accounts. If you don’t identify these accounts, it will be difficult for your successors to even know that they exist because there simply will be no paper trail. Also, make a list of all the e-mail accounts you have and use. Many of us have several e-mail accounts these days. Work information. Lawyers might have access to client sites, collaboration sites, online document repositories or other information that no one else knows about. In addition, they might have access to software, online tools or online databases that someone taking over their work will need to have. In some firms, lawyers might have important network passwords, backup media or other digital assets the existence or value of which is not realized until they are gone. At this beginning point, you really want to gather and collect as much information as you can for your inventory. You can work on organizing and prioritizing later. This is a new area of estate planning, and this information is helpful to trigger our thinking about our digital lives…..and which parts of our internet interaction, our home computer, and our business computer have become our digital assets that should be part of our estate planning. My suggestion is that digital assets are well worth organizing and treating as assets of your estate. Your comments or suggestions are welcomed to this blog. And I am available to discuss steps for managing your digital assets beyond the above list…..if advisable, let’s talk.